This monument is a symbol of Piedmont Region and a place that inspired the writer Umberto Eco to conceive the best-seller “Il nome della rosa” ( The name of the rose ) , the Sacra of San Michele is an ancient abbey built between 983 and 987 on the top of mount Pirchiriano, 40 km from Turin. From it’s towers you can admire Turin and a breathtaking view of the Val di Susa. Inside the main Church of the Sacra, dating from the twelfth century, are buried members of House of Savoy (one of the oldest royal family in the world). Dedicated to the cult of the Archangel Michele, defender of the Christian people, the Sacra di San Michele fits inside a ruote of pilgrimage (long over 2000 km) wich runs from Saint-Michel ( France ) to Monte Sant’Angelo (Puglia). The history, the spiritual value and the landscape that sorrounds it trasform the Sacra in a special destination for visitors from all over Europe: pilgrims, faithfuls, tourists but also athletes who want to test themselves with climbing paths or mountain-bike. 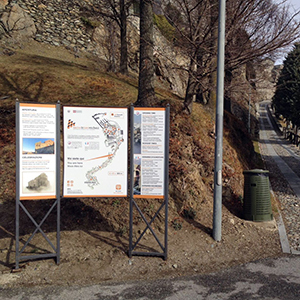 The Sacra di San Michele offers to its public guided tours and events during all months of the year. The different historical, architecture and painting sites are accessible to people with disabilities. Sacra di San Michele is made of history, art and culture. They appear to visitors of all ages with great impact and immediacy. First of all we enjoy the path in the green and, going up, the landscape and the imposing facade. Once you reach the entrance of the Abbey, the Sacra is ready to unveil some of his most evocative elements: the statue of San Michele the Archangel, created by sculptor Paul dë Doss-Moroder ( from Alto Adige ) , the Stairway of the Dead with the Zodiac Portal and the legendary Tower of Bell’Alda. During special visits in the first Saturday of every month you can also enjoy the daily life museum, the library has about 10.000 books, the ancient Halls of the House of Savoy and, again, tombs, arches, portals and paintings to discover alone or with an official guide at your disposal. The Sacra of St.Michael is open all year long with different visiting hours during the work days and the public holidays, in the winter and summer. Visitors are admitted until 30 minutes before closing. The Sacra di San Michele can be reached by car and bus ( just close to the top of the mountain ) or by train up to Avigliana and then with the shuttle bus ( active from 15 May to 16 October 2016), by mountain-bike or on foot via hiking trails. Click enter and discover all our exhibitions each month of the year: concerts, special guided tour and much more. Don't miss them. 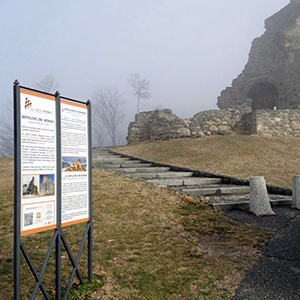 Ancient heart, modern mind and always looking to the future: the Sacra di San Michele shows its long history throught the latest technological innovations. 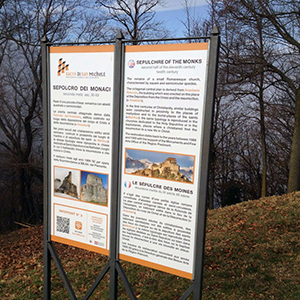 Panels positioned along the route provides to the visitors of the Sacra details and informations about the Abbey and its points of interests. With the possibility to deeper then through the QR code system. Simply scan the code with your smartphone or tablet to view the contents.